Having spent the past week or so on vacation with Liz’s parents at their home in southern Belgium, we’d originally planned to fly back to Canada tomorrow, November 10. Seeing that the French Youth Convention was scheduled for the same weekend, we were just too close and the timing was too perfect to miss. It would only take 3-4 hours, by car, to drive from southern Belgium to Melun (where Pastor Nowacki’s church is located) and we could fly out of Paris’ Charles de Gaulle airport the following day, November 11th. A quick adjustment of plans, arrange a car rental and voilà… we were off to France and YC2013 bound! 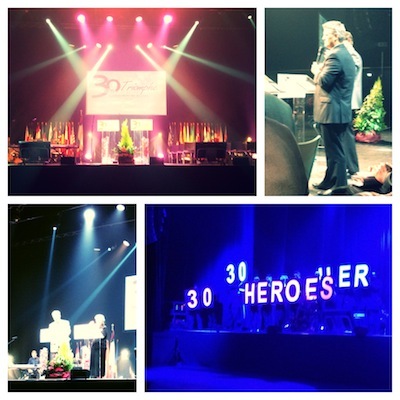 This year marked the 30th anniversary of the convention, hence the theme… 30 ans Triomphe (30 years Triumph). Although it has consistently been organized by Bro. Nowacki’s church, it is no longer simply for the young people of France. Young people were present from Denmark, the UK, Belgium, the Netherlands, Switzerland and other European countries. The guest speaker for the weekend, Rev. Robert Tisdale of Dallas,Texas, was to minister in the four convention services (This afternoon & evening and tomorrow morning & afternoon). Pastor Nowacki and his team knew that we were coming but little did we know that they’d usher us to reserved seating front and center in the auditorium; we wouldn’t miss anything of what God would do in these services. We reconnected with the missionaries (the Nowackis, the Brochus and the Balcas) as well as national pastors with whom I’d taught during IBF (Institut Biblique de France or French Bible Institute) in 2009, 2010 and 2012. M any of the present and former students also came to greet us, meeting Liz & the kids for the first time. 60 young people presented Héros de la Foi (Heroes of the Faith) this evening. During this black-light presentation they cited the names and stories of 30 biblical heroes of faith and affirmed how they themselves would, like those they cited, strive to be a hero of the faith to this, their generation. Bro. & Sis. John & Anne Nowacki, themselves heroes of the faith in France, introduced the presentation. Sis. Nowacki was, after all, the first national youth president when they arrived in the country over 30 years ago. They recounted the history of France’s youth department and the convention which grew out of it… having grown to over 800 this year. We got to meet Rev. Mike Tuttle for the first time. He is a former missionary to the Netherlands and currently the Global Missions Department’s Regional Director for Europe and the Middle East. Although I was unaware that we would meet him, it was nonetheless great to do so, as he will be one of the men who will consider our application for AIM appointment, and will be part of our reporting structure once on the field. 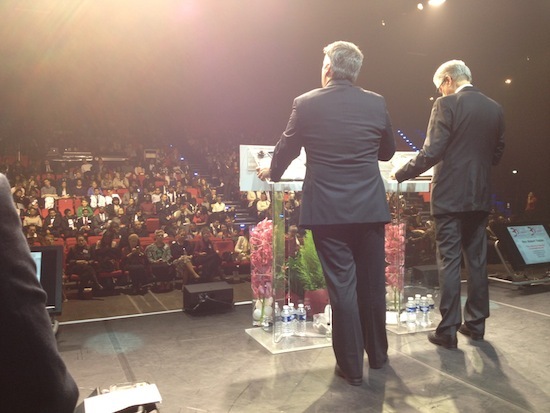 Day 1 of the convention, with our view from VIP, was wonderful!